Thomas Jefferson said, “It’s a poor mind that can think of only one way to spell a word.” Had our founding father known his way around a gym, he’d surely have found the same to be true of how we use a piece of exercise equipment. Just because a tool is designed for one purpose doesn’t mean it can’t serve others. Here’s how to get more out of common training equipment to hit your muscles in new ways, work around injuries, and cut minutes off your workouts. Most gyms have a trap bar—the thing that looks like a barbell with a large hexagon in the middle (shown, right)—and all have an adjustable bench, lat-pulldown station, and straight bar. The trap bar is mainly used for trap-bar deadlifts, a joint-friendlier squat and deadlift substitute; but you can also use it to do bentover rows and shrugs with a palms-in grip—a stronger pulling position than palms down. A bench can support your chest for rows just as well as it can support your back for presses. And a lat-pulldown station can easily give you the toughest glute and hamstring workout around. Finally, you know how to use a barbell with both hands, but lifting it with just one hand attacks your muscles—and your core—in a brand new way. Experiment with the routines that follow, and declare your independence from boring workouts forever. Perform exercises marked with a letter (“A,” “B,” and sometimes “C”) in sequence. So, you’ll do a set of A, then rest; B, then rest again; and C (if applicable), and rest, then repeat till all sets in the group are complete. 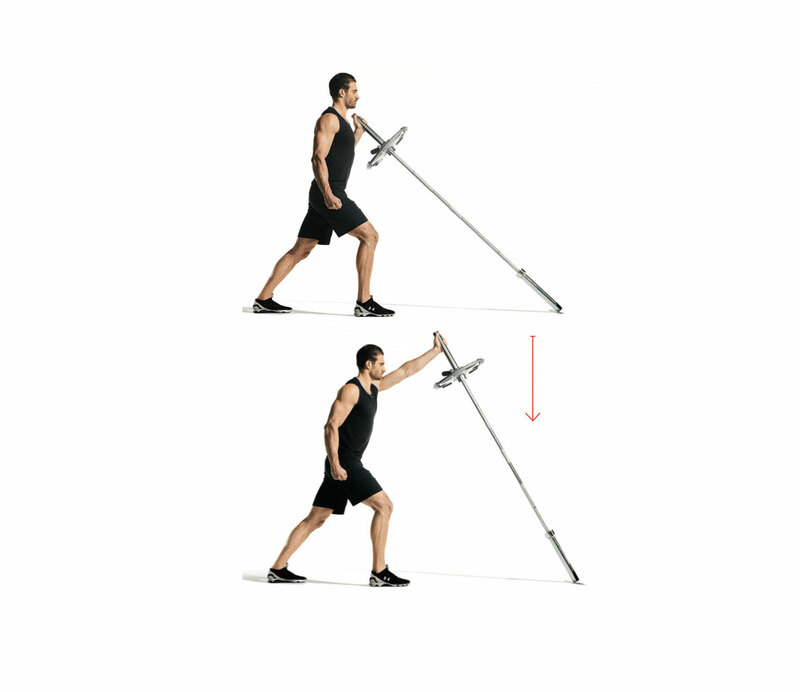 Stand in the center and bend your hips back to grasp the bar’s handles with both hands. Keeping your lower back in its natural arch and your chest facing forward, drive through your heels to lift the bar off the floor and lock out your hips. Sets: 3 Reps: Hold for 30 sec. Get into pushup position, then bend your elbows 90 degrees so your forearms lie flat on the floor. Brace your abs and keep your body straight as you hold the position for time. 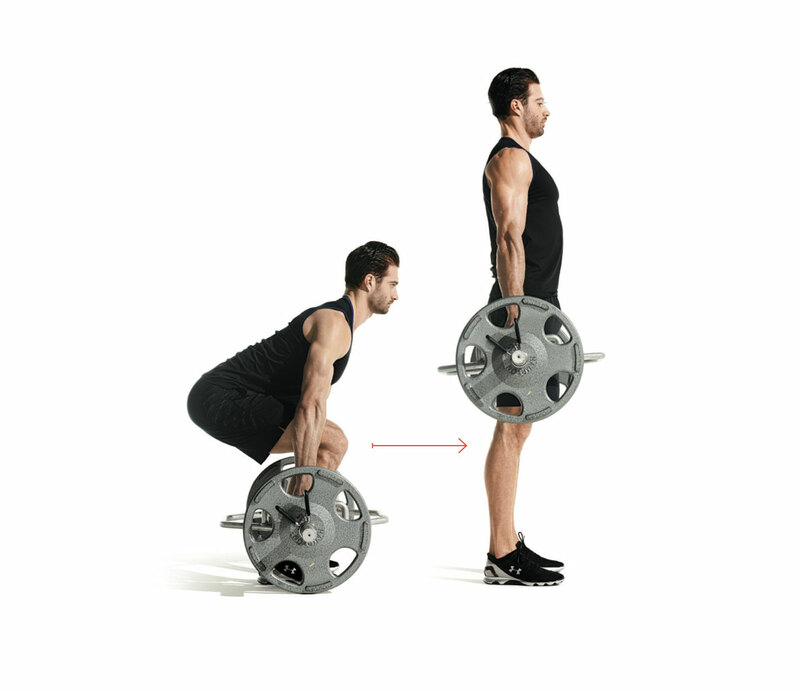 Perform a trap-bar deadlift (described above). Then, keeping your lower back in its natural arch, bend your hips back until your torso is parallel with the floor. Brace your abs and squeeze your shoulder blades together as you row the handles to your ribs. Perform a trap-bar deadlift (described above), then shrug your shoulders as high as you can. Stand lunge-length in front of a bench, holding a dumbbell in each hand. Rest the top of your right foot behind you on the bench. Keeping your torso upright, bend your front knee and lower yourself until your rear knee nearly touches the floor. Lie back on a flat bench with a dumbbell in each hand. Press the weights from shoulder level directly over your chest. Lie on your right side and rest your weight on your right forearm. Stack your feet. Brace your abs and raise your hips off the floor. Hang from a chinup bar with palms facing you. 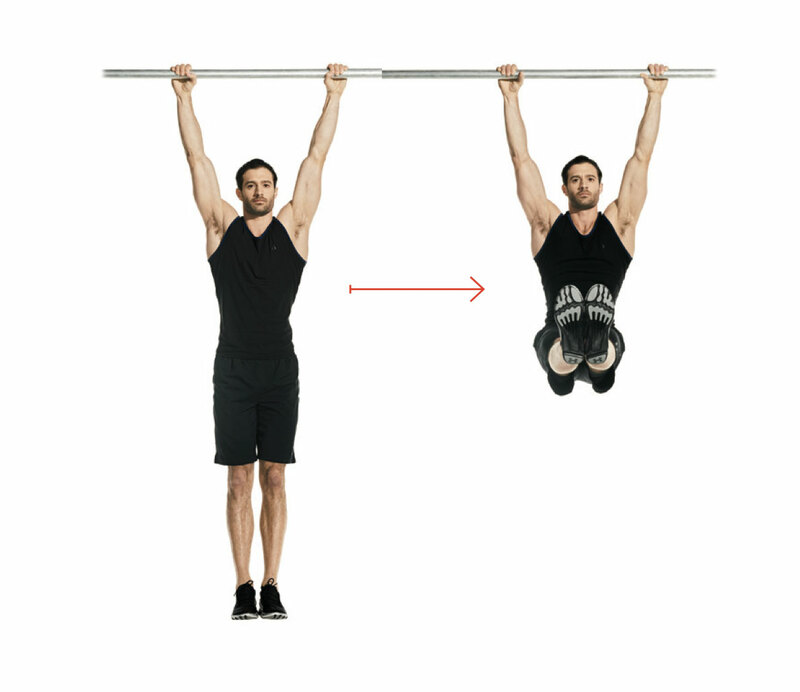 Squeeze your shoulder blades together and pull yourself up until your chin is over the bar. Hang from the bar, contract your abs, and explosively raise your feet overhead. Try to kick the bar. Return to the starting position with control. Set an adjustable bench to a 30- to 45-degree incline and lie back against it with a dumbbell in each hand. With palms facing forward, press the weights up from shoulder level. Use the same bench setup as above, but lie chest-down holding dumbbells. Squeeze your shoulder blades together and row the weights to your sides. Lie on your back on the floor and bend your left knee to rest your foot flat on the floor. Extend your right leg. Brace your abs and drive your heel into the floor to raise your hips into the air. Don’t let your lower back overextend. Use the same bench setup as the incline dumbbell press. Keeping your upper arms at your sides, curl the weights. Using the same bench setup as the incline dumbbell press, hold a dumbbell in each hand and press the weights directly overhead. Lower the dumbbells close to your chest, flaring your elbows out, then press them back up. Hold a dumbbell in each hand and step forward with your left leg. Lower your body until your rear knee nearly touches the floor and your left thigh is parallel with the floor. Step forward and repeat on the right leg. Grasp the bar with hands just outside shoulder width and arch your back so there’s space between your lower back and the bench. Pull the bar out of the rack and lower it to your sternum, tucking your elbows about 45 degrees to your sides. When the bar touches your body, drive your feet hard into the floor and press the bar back up. Lie back on a bench with your hips right at the end. Reach back and grasp the sides of the bench to secure yourself. Brace your abs and raise your legs until they’re perpendicular to the floor. Slowly lower your legs until you fee you can’t control the descent anymore, then raise them back to the starting position. Keep your lower back on the bench at all times. Sit at a lat-pulldown station and secure your knees under the pads. Grasp the bar with your hands outside shoulder width and squeeze your shoulder blades together as you pull the bar to your collarbone. Face away from the lat-pulldown station and kneel on the seat, securing your ankles under the pads. Your knees should be bent 90 degrees. Have a partner stand near you for support or have a sturdy object nearby. Slowly straighten your knees and lower yourself as far as you can. Keep your abs braced and hips extended. Squeeze your glutes and bend your knees to pull your body back up to vertical. Use a landmine unit or wedge a barbell into a corner. Load the end of the bar closest to you with a plate and hold the same side of the bar at the very end with your left hand. Get into a staggered stance with your right foot in front. Press the bar overhead from shoulder level. Use the same setup as the landmine press but step back into a lunge, lowering your rear knee until it nearly touches the floor. Rest your left knee on a bench and place your left hand farther up the bench for support. Pick up the loaded end of the bar from the floor with an overhand grip—the other end still attached to the landmine—and row it up to your side.